Some reveals are meant to be shared around Halloween. When this family of three moved north from the happening Logan Square Chicago neighborhood to the quieter city haven of Ravenswood Manor, filled with old homes, leafy trees and river views (maybe I'm biased), they brought their style and a massive record collection with them. The house was mostly greige walls and less than ideal light fixtures - enter Unpatterned for interior design help. I met one of the homeowners at a neighborhood event at a local bar and when she reached out shortly afterward to work together on bringing their personality to their new home, I could tell we'd have some fun with it. We made this traditional home reflect their personalities starting with the entry: you're greeted by a zig zag green and gray paint pattern and brass chandelier. The green/gray is a glimpse of what is to come in the living room - Flavor Paper's "Dia de Dumbo" wallpaper in money green and pairs with the slate tile. We added the reclaimed wood shoe bench, mirror and shelf as well. The family Converse collection KILLS me. Top color is Benjamin Moore 1602 Gunmetal, bottom is HC-135 Lafayette Green. The built-ins and brick fireplace were painted white when we started, but taking the brick to the same dark gray in the entryway and the fireplace wall, including the back of the bookshelves, to a deep plum (BM 2073-20 Autumn Purple) rounded out the palette and worked with their existing green sofa. This was another case of clients having great stuff - artifacts from trips, art, collected objects, and a full library. We were able to style their shelves with items and books exclusively from their home. We added in a black and white textile base, plum velvet accent chair and the leather ottoman creates the perfect spot to put up your feet and enjoy the real showstopper: the custom designed and built record cabinet! We worked with local craftsman, Rob from Emotive Reclaim, who collaborated to refine the details and created the record cabinet to our size and specifications for maximum storage and of course aethetics. We knew when he delivered the samples of the india ink cerused ash that would be grain matched across the front, paired with the blackened surround and black steel legs that it would be a PERFECT for the space. And maybe would hold a few records. Okay A BOATLOAD of records. No house is complete without a bar. We tend to have clients with well-stocked bars. The age old "what do I do with a non-functioning firebox" question? How about some old books and a skull? The last space that we added some impact to on this floor was the dining room. We took the time to have the light fixture re-centered over the dining table. 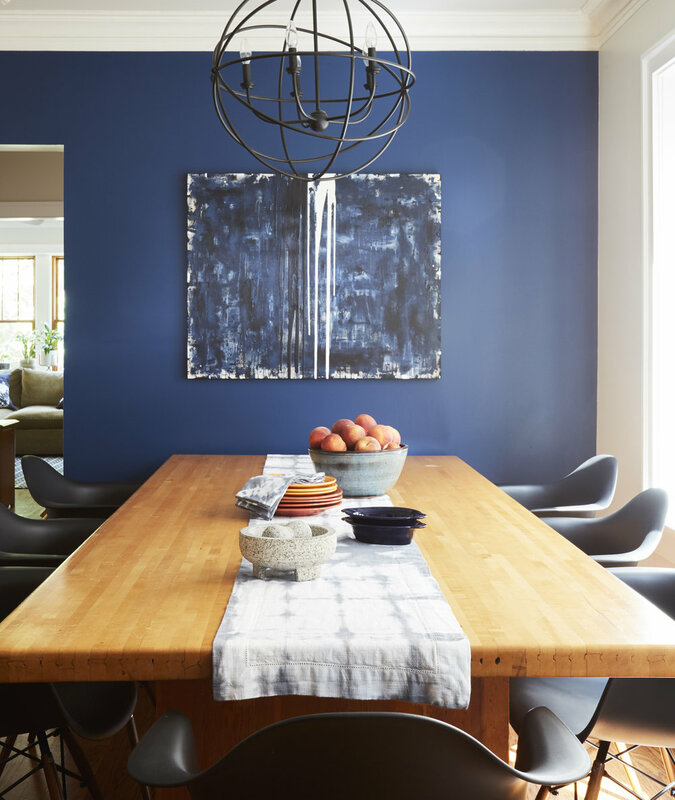 We added a deep blue (BM 2061-20 Champion Cobalt) accent wall to pair with the new custom painting, added a black orb chandelier and swapping their nondescript dining chairs for black Eames ones that had more presence at that massive table gave the room an equal, cohesive, but different personality. This is good example of accent wall winning over painting the entire room. The room is open to the kitchen so we'd be hard pressed to find a good stopping point for the paint without painting both rooms, which would've felt like too much in this particular space. However, the blue wall added the mood and color they were looking for and took a little of the focus off a really huge table, which was a good thing in this space. We say it ALL. THE. TIME. But seriously, the power of paint and lighting is no joke. You can see the whole collection of photos here. Next up we are tackling a major renovation of their master suite!